This lonely Ring Dove was spotted on tight cable perched alone for quite sometimes. The Ringneck Dove, Ring Dove, or Barbary Dove, Streptopelia risoria, is a domestic member of the dove family (Columbidae). Although the Ringneck Dove is normally assigned its own systematic name, as Streptopelia risoria, considerable doubt exists as to its appropriate classification. Some sources confidently assert that it is a domestic form of the Eurasian Collared Dove, S. decaocto, but the majority of evidence points to it being a domesticated form of the African Collared Dove, S. roseogrisea. It appears that it can hybridise freely with either species, and its status as a species must therefore be regarded as doubtful. However because of the wide use of both the common and systematic names, it is best to consider it separately from either of the putative parent species. Amazing work, wonderful minimalistic composition, simpley perfect cut. Excellent wires. Fantastic bird. Solitude. Splendid isolation. Fine lightness and colours. Good contrast. A nice geometrical composition, very minimal but effective. The position of the bird is perfect and light management is impeccable. Well seen and artistically presented. An original view, but it tilt on the left. I propose an other version in WS (more easy to me to show what I mean by a workshop because my english is bad). Hope you like it. This is one very much artistic composition with beautiful framing,the electricity wires makes a beauitful pattern. Cool. To Cool. What a great image for study. I like it. Very good eye on this one. I like the composition...it has oriental mood...jf cacth the soul. I like the difference and teh aesthtetic essence.Beautiful image with good light. 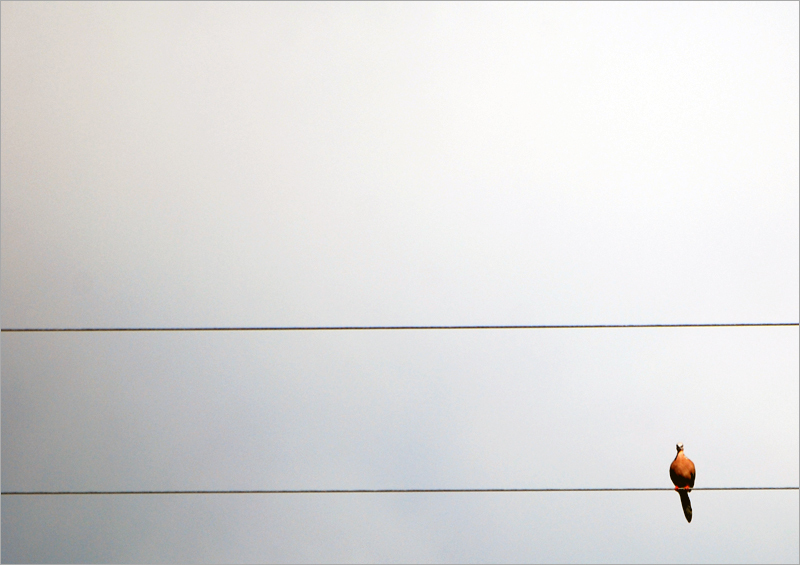 Hey hey , what a mmmmminimalist image Jusni , a bird on a wire and nothing much else , when little means more ! Indeed while your compo lacks in specific detail ..hey i would be hard pressed to find a ring around the bird's neck ...but is that relevant here ? ... it does raise interest by its incredible simplicity and the serenity it evokes and conveys . i am just as happy to come across this type of image as i would be for a nice close-up of a flower or a bird head somehow . Imho the bird is well placed in your frame , a slight tilt to correct and bingo, my compliments , i like it ! Agree with Reflex panning carried out. Artistic presentation. Compliments. Enjoyable week. Very nice minimalistic compo !